London's underground system is to be brought to life in a new BBC cartoon series for children starting next year. The computer-generated animation Underground Ernie revolves around Tube supervisor Ernie for whom ex-footballer Gary Lineker provides the voice. He is joined by trains named after the Bakerloo, Jubilee, Victoria, Circle and Hammersmith and City lines. Transport for London (TfL) will share the merchandise royalties in return for allowing its logo to be used. 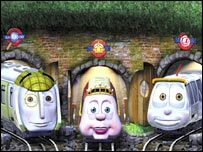 Each of the trains has a different character, with Bakerloo being a detective, Circle a hippy chick, Victoria a caring grandmother, Jubilee a gadget-mad teenager and Hammersmith and City competitive twins. Ernie will also be visited by trains from other countries to give the show international appeal. Each episode will have an educational theme running through it. Gary Lineker said: "I think it's a wonderful idea and the animation and stories are terrific." TfL said: "We hope Underground Ernie proves a positive role model for its audience." It cost Joella Productions £4m to create the series which comprises 26, 12-minute episodes. The BBC confirmed it would be showing the series on its CBeebies channel.